Some crops are best left to the professionals. I’m talking about sweet corn. A few of our gardening neighbors are trying to grow sweet corn, and the ears are just filling out now. I’m pretty sure the raccoons are watching these few dozen precious stalks of sweet corn just as anxiously as the gardeners. Growing up on a farm, sweet corn was a plentiful and wonderful treat of summer. My mother would boil up dozens of ears to satisfy her brood of six hungry kids. We would sit at the picnic table and slather butter on the corn, dripping butter and milky corn juice down our arms as we ate. The big debate was whether you ate rows across horizontally (like a typewriter), or ate a row around the cob. When I moved to the East Coast, I discovered Silver Queen corn, with its sweet tender white kernels. This corn rules the loamy soil of the DelMarVa peninsula, and is widely available in the summer months. Every summer when our boys were growing up, we would go to Rehoboth Beach to soak up the sand and surf. On the trip home, sunburned and tired, we would stop by one of the dozens of roadside stands and load up with fresh fruits, vegetables – and sweet corn. 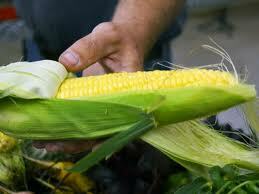 The development of sweet corn is attributed to the Iroquois Indians in the late 1700s. Over the years, horticulturalists have bred yellow, white and even bicolored sweet corn. Silver Queen was the early name for the iconic white corn. But over the years, it has given way to even sweeter varietals. But at the roadside stands, white corn is still uniformly called Silver Queen, whether it actually is or not. I’ve tried many recipes for corn — grilled in the husk on the grill (time intensive), grilled, smeared with mayo and bbq spices (must be a southern thing), sprinkled with Old Bay seasoning (a Maryland thing) or microwaved (shudder). I’m a traditionalist for this veg. Buy sweet corn only if you plan to eat it that day. If you’re lucky, it came out of the field before dawn that day, so it will be at its peak tenderness. The longer corn is out of the field, the tougher the corn kernels become. Put a big pot of water on the stove to boil, adding 1 teaspoon of sugar and 1 teaspoon of salt. When it’s simmering, add your shucked ears, cook for 8-10 minutes and remove to a platter. Serve steaming hot with plenty of butter. And napkins. AH, YES!!! We have been harvesting corn… Despite the lack or rain, I picked 115 GOOD ears from a 54′ double row of ‘Incredible’. We still have 3 more double rows that will be ready in a couple of weeks. It should be a lot better as we are getting a little rain now. GREAT POST and it does bring back memories as a kid eating fresh corn on the cob and getting butter all over my face. Glad I am following your blog! Wow, that is an amazing harvest! Congrats.